…the world feeds us and we need to give back to the world. We all wonder what is the purpose of our existence. This is the ultimate rocket science, and not many has figured this out, but those who do, live their lives in the greatest of wonder and splendor. Of late, I am mired in a cesspool of dark thoughts that surrounded me, slowly but surely, I get stronger from this constant battle, inside of me, and through my own doubts, critical thinking and understanding of my own vulnerability, I begin to understand why I am like this, and what it is to be done with me. A lot of good meaning people tried to help, Steve told me it is a mid life crisis thing, your mum told me it is a certain insecurity. She has her point, we will talk about that in a while. But I realized that I am mildly, depressive. The thing about me is, I will always find an answer to my woes. There are incessant questions, issues and problems that I tussle with everyday, in my head. Somehow, I always have the intuition to come out of it, with an answer. To that day, I was browsing through Facebook, and I came across this article ‘The Mental Health Issue Men Never Talk About‘; while I don’t believe at that time of reading, that I am ‘depressed’, I decided to try an online Depression Test, and lo and behold! The test results showed that I am ‘mildly depressive’. It was one of those casual test, 16 questions, I did it on my phone and I wondered at the results. At this point, I need to be critical and careful about ‘branding’ myself, but I let that reality sink in a bit. Being ‘mildly depressive’ didn’t hit home, it was something else, but while I am at it, depression does feels like something I am feeling now. so I am going to deliberate on that a bit, my mind will always comes to an answer. My brain is like that, a kind of sniffer dog, and when I let the mind wander, I will pick up vibes and nuances that resonates strongly. Sometimes, my mind will pick up a fake scent, lose a scent, or a very faint scent. Whatever it is, my sniffer dog mind will wander, and relentlessly seek out and find, whatever that is out there. It is a process, and the mind needs to wander, you will need time for the dog to go around up and down in the most non-linear way. So I don’t stand in the dog’s way, and whenever I can, and have the luxury of time, I let the dog wander, and bring back the quarry, whatever it may be, and I think my dog is on to something. The journey in my mind of late, has been perilous, and dangerous. There is a chance that I might go crazy, turn into someone completely different, and I think that is the message I am getting, I need to be someone completely different, as right now who I am, is not serving the greater purpose. Society will challenge us, people will doubt us, so we become a fraction of ourselves so that we can fit society, and the expectations of those around us. We do all that to become accepted, but the irony, and boys, this comes from experience, the more we try to get that acceptance, and fit in, the more we get rejected. It is a lesson I learned again and again, to fit in, we need to stand out. Nobody ever fits in to anything, anywhere. When we try to do that, all we do is become a shadow, it dims the world. While I am at it, one word keeps ringing out, act. Put out action. Time for deliberation is over, the time to act on things is here. As a Piscean, I over-think and over analyze things, a lot, which is good for a critical mind, and bad, when it comes to action. The first 40 years of my life has been dedicated to thought; I need to know what I know is absolutely true, robust and resolute. I need to know my intrinsic value. Once the thinking is cleared, it is time for action, acting on life always guarantee an outcome. While the outcome might not suit what you expected, the next action you must take, is to either work harder to get the desired outcome, or adjust your expectations of the outcome. To get all these done, needs action, not thought. The world has turned too much into a ‘Me’ world. while that is fine, to better that; the ‘me’ has to give back to the world, so that the ‘me’ can continue to be ‘me’. When what we do, does not benefit the world, and make the world a better place, the world we are in will destroy us eventually. So don’t lie to yourself to think that the ‘me’ will continue, irrespective of what the world becomes. It doesn’t, the world feeds us and we need to give back to the world. And we can only do that in our own unique way. So boys, as your dad, you need to find you own way. I can guide, provide resources, but you have to use your own guile and cunning to make sure that you can benefit the world, and not just benefit from the world. Who is your first Aikido sensei? Who is my first Aikido sensei? The fellow teaching you how to turn, roll and wears a funny black pleated skirt-looking pants? You first Aikido sensei is your parents. Your mother showed you love, and affection, your father protects and nurtures you. They are the foundations of love and harmony that Aikido is all about. I watch last evening as Harry sensei taught this young Aikidoka how to roll properly. As I watched, I came to this realization that he is like a father teaching his son. I can feel that because I am a father myself, and I would use the same energy, attitude, of unconditional effort, openness, hands on to teach my sons, whatever they are learning. I saw that in Harry sensei last evening, the effort, and unconditional love is the same. It was a very profound experience as the whole relationship paradigm in my Aikido training was radically shifted. I left the class with a feeling of total awe, and more importantly a renewed sense of humility. Training with NUS students has opened another level of understanding for me. These young boys and girls, is easily 20 years my junior. And I had almost 20 years of training in Aikido. That said, what about Harry sensei, he has close to 50 years of training! He has been training long before anyone one in class was born! So when I look at the faces of my young fellow Aikidokas, the youth is still there, the innocence are still present. I can sense that because, given another 10 years, my elder son, Ian, will be 19 years old, about that age of a NUS student. They still carry the dreams and aspirations their parents have for them. Edna, Jia Hwee, Tri, Glenn, Jade, Darius, Cathryn, Rachel, just to name a few names, their parents gave them the names, very much like how I bestowed upon my sons, theirs. They came to class, to NUS with their parents, in spirit and in faith. Hence, you are not simply training with that person, you are training with a person who has been exposed to love and affection, with understanding and attention long before they stepped into an Aikido class. So they are an expert in their 18- 19 years of living, and me? I’m just a beginner in their lives! That can be said for Harry sensei himself! He has parents, his parents has aspirations for him, perhaps they’d wanted him to become someone of stature, or they had other expectations, I wondered, had his parents came back and look at him now, taking a class, 6th Dan in Aikido, would that had been what they wanted from him? Certainly my parents didn’t expect me to embark in Aikido training. More often than not, we did not choose to embark on our Aikido journey, but somehow stumbled into it, and continued because of certain circumstances that compels us to continue, it was probably one of the last thing our parents expects of us. We need to give back, our parents has been our first Aikido sensei, and now when we learn how to love and live in harmony from someone else, we need to give this back to them, perhaps now that we’ve grown up and our parents might have thought that their kids no longer need so much love and care, but they still do care and love us, just as much, or perhaps more. Now that we are adults training in Aikido, we need to love them back. Things we learned in the dojo, we need to practise it with our parents, let them know that their love and efforts has manifested, their kids has not wasted their love and effort, well we may not be everything our parents wants us to be, but we can let them know that their love and efforts hadn’t gone to waste, their children has done fine and is now learning how to love on the foundations that they have given us. As of current: Harry sensei is now 7th Dan Shihan. A couple of lessons back, a chirpy white belter, Mary asked me if what she was doing was correct, as I partnered her. I told her that just enjoy the moves, as it will be too much to correct as almost everything she is doing is ‘wrong’. We need to understand that getting from ‘wrong’ to ‘right’ in martial arts, takes a heck of a long time, and sometimes, you will go from wrong to right and back to wrong. Personally for me, as long as the Aikidoka enjoys the moves, and stay relaxed, avoids injury, that is a decent session of Aikido. One thing we must be careful as beginners is the penchant to over correct, we analyze over the nitty and the gritty, until we think that everything we do needs improvement! Well, duh, that is precisely why we come to the dojo right? To day by day, unlearn our habits, and learn something that is closely resembling Aikido. Nobody gets it right at the onset, so why even bother to try? It is a long arduous process that is very un-instant gratification. The more you try to get it right, the more wrong it will get, for beginners, there is only a general sense of body movement, positioning and effectively use of our strengths. the other stuffs we learn along the way. So everytime I go to class, I will look forward to enjoying the movement, enjoying the company. Right movement will come from right attitude, and when you enjoy your movement, you will be cultivating the right attitude. One thing we must be careful as beginners is the penchant to over-correct, we analyze over the nitty and the gritty, until we think that everything we do needs improvement! Well, duh, that is precisely why we come to the dojo right? To day by day, unlearn our habits, and learn something that is closely resembling Aikido. So every time I go to class, I will look forward to enjoying the movement, enjoying the company. Right movement will come from right attitude, and when you enjoy your movement, you will be cultivating the right attitude. I’ve been training with Harry sensei, since I joined Aikido. That was more than 20 years ago, and while the thought of looking for other sensei has occurred to me, I never really gotten around to actually do that. I don’t know if it is a ‘loyalty’ thing, or what, but I like training with him and I cannot see myself training under another sensei. Harry sensei is slowly inching towards eighty. He is human, and while he ages, his Aikido will slowly degrades. I can sense it as I’ve been training with him for a long time. He is still sharp, and very technically sound with his Aikido, but you can feel the strength waning. All martial arts is still a matter of physics, muscles, youth still trumps with strength and brute force. Aikido will all the blending can only blend so much. A bone will still crack and break if you put the strength of a young 20 year-old karateka in a straight punch. Don’t get me wrong, Harry sensei still has it in him, he can still move, he still amazes people, upsetting their balance with a flick of his wrist. But the day will come where he will no longer be able to do it. The question for me is, as his uke, will I still allow him throw me around. When that time comes, as his uke, do I still continue to fall, ala charity. Or not fall, as he will not be able to make me? I’m not sure if the general public, or even practicing Aikidoka can understand that when, Harry sensei reaches that age, I’d probably do what sempai Tristan did as well, to give “charity fall”. While the entire thing will surely look fake, I certain do hope that people can see the spirit and the connection between two persons training together for a very long time, the connection between the teacher and the student, the connection between a sunset and sunrise. While the sun sets, into darkness and gives in to the moon, the sun never really goes away. Metaphorically, that is how it goes, Aikido is very much like the sun, it will not go away, and the warmth and light will still be felt, very much long after the sensei is gone. The only question is that, what will the student, become? 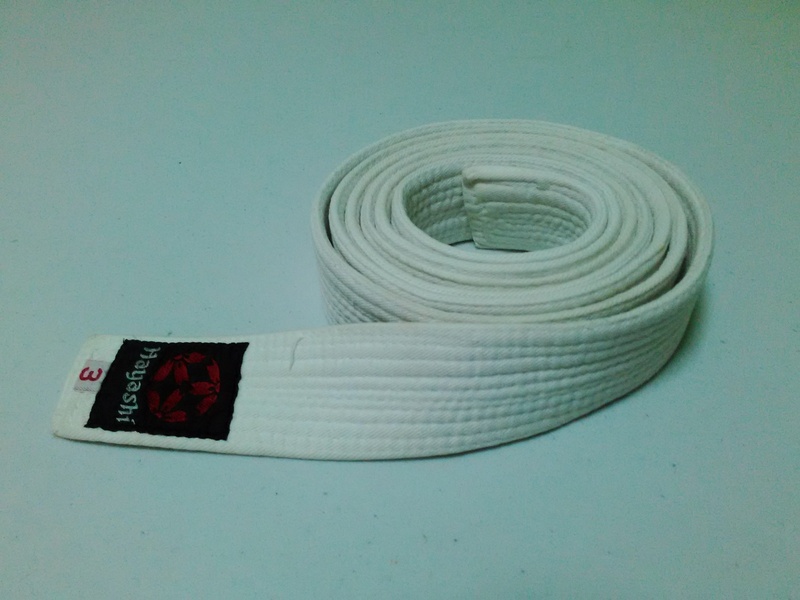 Back in Bukit Merah SAFRA Dojo, I was holding a brown belt, try and spot me! As parents we are constantly bombarded with opinions and lessons, from other parents, our own parents, and of course, everyday experts. One of them is the issue of carry our babies, how much, how often, when and other minute minute details, the argument is not unlike that of car enthusiast on oil change, when, what oil? At what mileage? Others also say that when the baby is in distress, they need 抱抱 as a source of security and comfort. Well, the arguments on such issues are like which one is better? Day or night? We heard them all, and when Ian was born, in 2009, the internet hadn’t really taken off in a big way, there were no Facebook, yet (these were the days!). So like all parents we listen to these opinions and unlike most parents, we decided to put critical thinking to the issue, and decided to 抱. And 抱 as much and as often as we possibly can and allow. Which turns out to be quite frequent, a decision we look back, and say, it was the right one. Baby harness was such a wonderful invention to parents, we have a Baby Bjorn carrier, we got off a Japanese parents, having a garage sale, leaving Singapore for good. We were new parents and we didn’t really know how to use that? Me, falling back to my SAF days, I simply look at it as another LBE (Load Bearing Equipment, ala SBO), another webbing soldiers used on them to put their magazines, water bottles, grenades and stuffs. This one for parents, put baby. The harness did one thing more important than the rest, it allows a very close parent/baby bonding. There is nothing in this world that can replace a human touch, especially when a parent touches the baby. A harness allows that and more, when we move, the baby can pick up our movement and learn. When the baby is asleep, the parent is able to provide a certain Dunlop pillow effect, size and cushioning is depended on wearer. The gist of it, is it gives a human to human touch and transition, the baby in the harness is learning everything humanly possibly about being a big human, from an angle of touch, proximity and from the single source of comfort and security. Oh, let’s not forget that baby smell! That sweet concoction of baby power, soft baby skin, a dash of moisturizer, and some baby sweat! This is the luxury for parents, and on an harness, you can catch a whiff of that it is upwind, or simply bend forward and smell that smelly head! Your mum, loved the sarong, and used it very extensively, especially when Wayne came along. We were predominantly using Baby Bjorn with Ian and with Wayne, sometimes, but Wayne’s bonding with the mother develop very much with the use of the sarong. The Sarong we have was an evolved one, with 2 ‘O’ rings stitched to it, specifically for the use of carrying babies. The traditional ones used is just a long roll of cloth, wrapped around the adult, then for the cavity created, you just insert baby. The Sarong, in your mum’s opinion, was better, as it followed the body’s movement in a much more natural manner, being just cloth, the fabric moves with the ebb and flow of our body. For the customer (baby), Wayne loved it as it is a much more cozier place to be in, compared to Baby Bjorn, which could only carry him upright. In the Sarong, we can carry Wayne upright, sideways; when he was smaller, he could snuggle up into the Sarong like a cocoon, so there was warmth, comfort and soft light. He can sneak into the Sarong and forget about the world. Harnessing Wayne in Hong Kong, we get weird looks as only Maids there does this! Unfortunately, the Sarong, being more of an evolved material, not entirely Bjorn (pun intended) out of design and thought, was at times, difficult to spread the weight properly, and this resulted in fatigue, and poor posture. Nonetheless, it was still preferred by our customer, and the advantages of using it far outweighs the shortcomings. We wanted to carry out babies. And we want to do that for as long as possible, as often as possible and as much as possible. We are not really in the ‘don’t 抱 camp’. To me that is pure BS, my logic being that, the window to carry our child will eventually ends towards 18 months, or sooner. By and large, we will no longer be able to snuggle, cuddle our charges when they starts to run and prance around, they will no longer stay coy in your embrace. They want to explore, run and hide from you, and when that time comes, it will be too late to get them for a good 抱抱. The best time to do so is when the baby are still weak, vulnerable, unable to walk, and are so dependent on us, as their carriers, ha ha. Looking back, there is no regrets. Those years spent, cuddling you boys, hugging, snuggling has built a bond between us that is rightfully Dad/ Sons, or Mum/ Sons. More importantly, it teaches you it is okay, to have touch. As there is touch between us, we impress upon the both of you not to be shy with your own physicality, you’re both comfortable with intimacy. That helps you both understand your own personal space and decide the distance between people. For those rare moments, we are right, with the both of you at this age, we are no longer able to harness you in a sarong (obviously! ), and we don’t hug and kiss as often as we used to. We have no regrets that we had those moments with you boys, where we hugged and kissed to our hearts content. Right now as you both grow up, we will only have those as memories to cherish. Hugs and kisses nowadays still, happens, but it is no longer the same as when you both were babies.